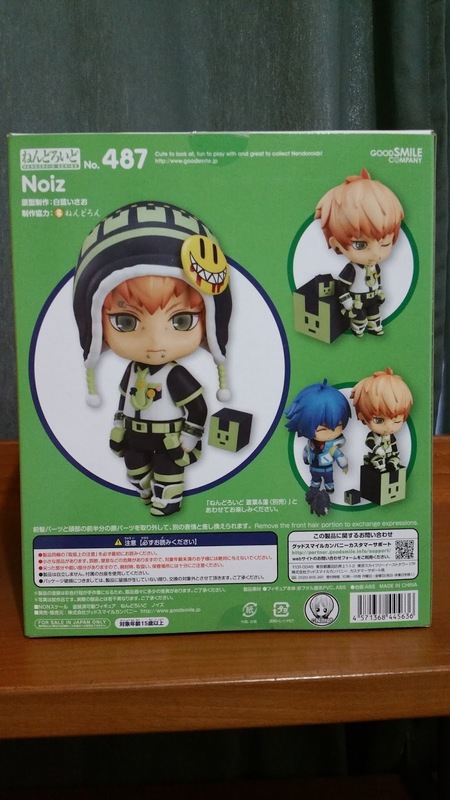 Nendoroid Noiz is the one I have paired with Aoba and also one of the two which I will be selling off. 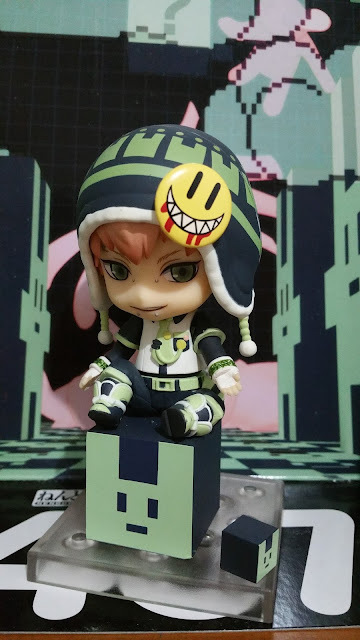 Before Noiz is gone, I'll like to review him and let this post be a reminder that I once had this Nendoroid in my collection. Front and back of the box and we see that Noiz is in his image color (green) and has a pose that is paired together with Noiz. 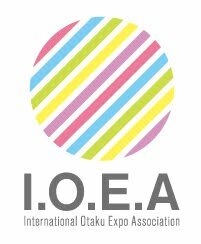 In the official mash-up of the two, we get a mature Aoba and the typical Noiz, however, an embarrassed Aoba and the "erogaki" Noiz is quite a nice change-up too! Here we can see that Noiz comes with three different faceplates, two different hair parts (with beanie and without), a number of limbs for posing and his all-mate. This isn't a lot but the three vastly differing expressions on the faceplates makes up for it sufficiently. Setting the default faceplate aside, let's look at the more unique two other faceplates -- the smirking as well as the annoyed ones! The dark, deep maroon lining the lips that GSC tend to use on male faceplates make them look manlier but sometimes make them look horrible too. This faceplate is a perfect example of how it is a success. 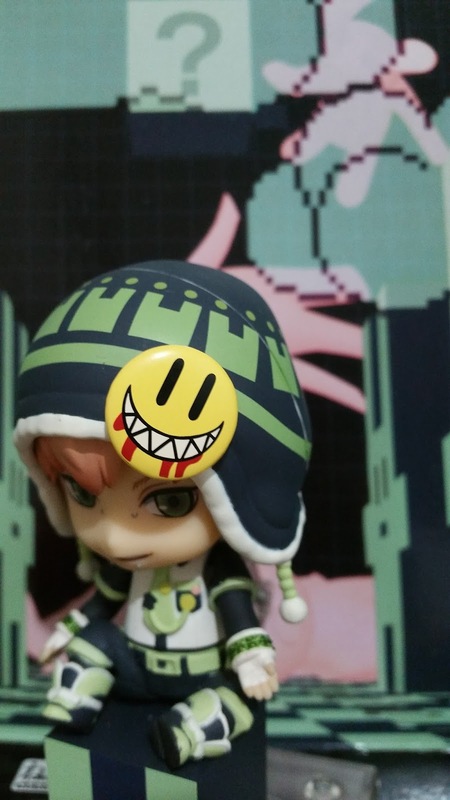 From the image you can also see how the beanie detaches into two parts so you can change the faceplate. Now, let's take a closer look at how the sculpting and painting of the figure looks like as well. 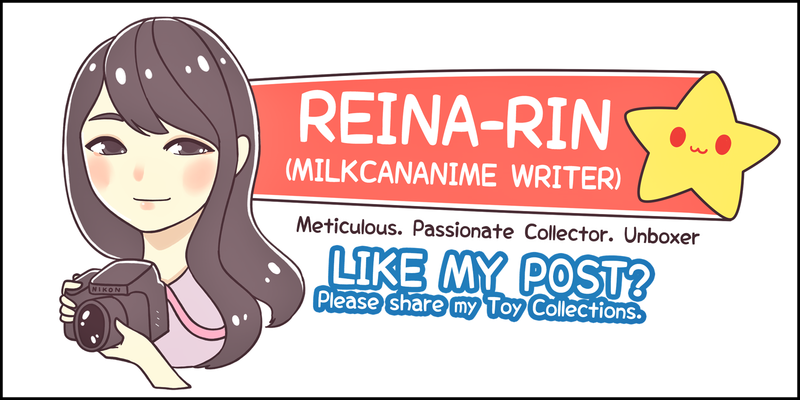 This badge is one of the things I love the most on this figure. 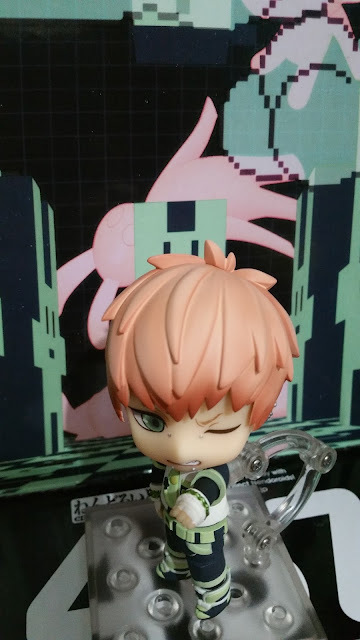 It is so accurate and so Noiz-esque that it comes to a point where it gets hilarious. I like how there is a top gloss coat to make it reflect light just like how a normal badge would. 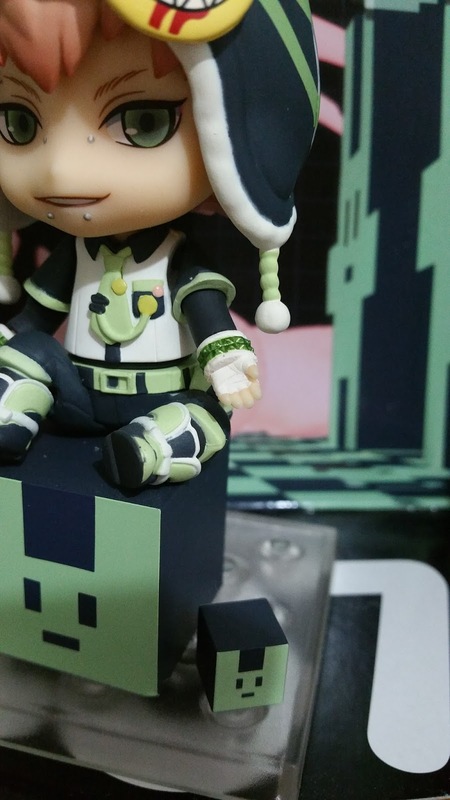 Zooming in on Noiz's attire, we see the use of a lot of greens which is Noiz's mage color. 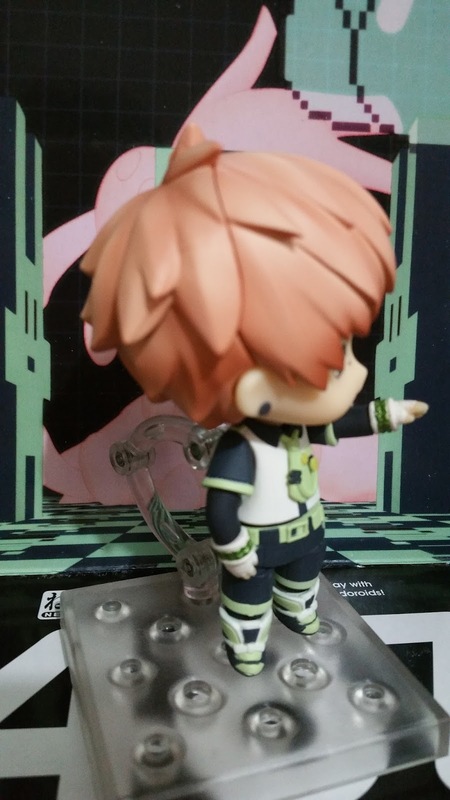 This is the same shade as the one that matches his backdrop (focusing on a scene in RhYme) that comes with the Nendoroid. 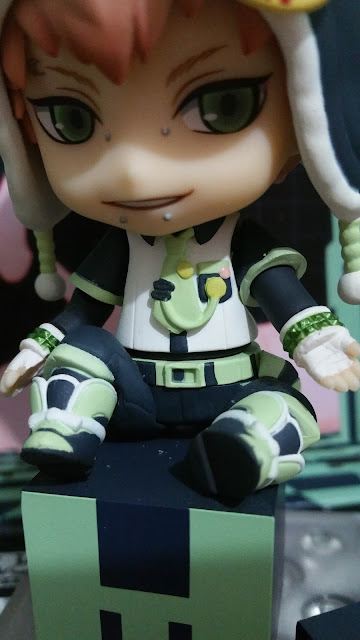 There are a lot of small details on Noiz outfit, going from the yellow badges on his tie and pocket, to the textured white bandages on his hand, and of course to the belt buckle. I would also like to draw attention to his bracelets which are in a glossy, darker shade of green, and has a texture actually sculpted on. 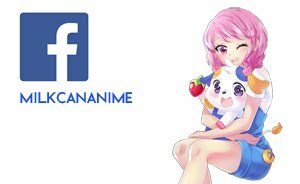 His shoes are very detailed also, with a lot of small and thin white borders framing the navy and green designs. However, the paint on his left shoe seems a little messy although the painting on the right shoe looks okay to me. 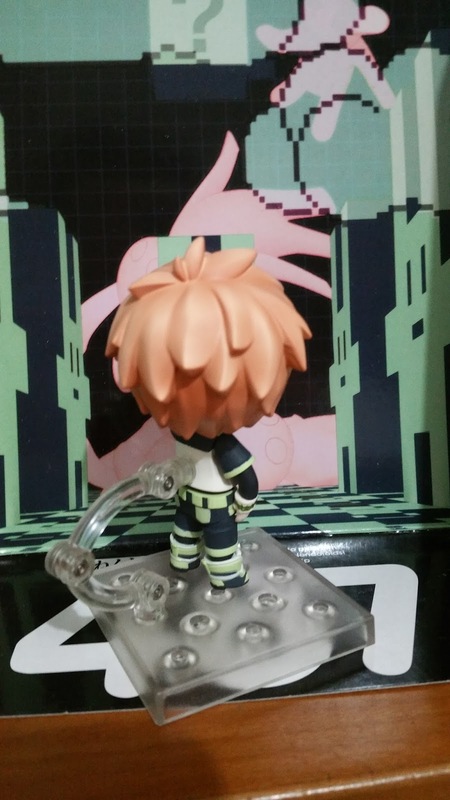 The back of Noiz's outfit also has a lot to offer. Going from top down, let's look at his beanie first. 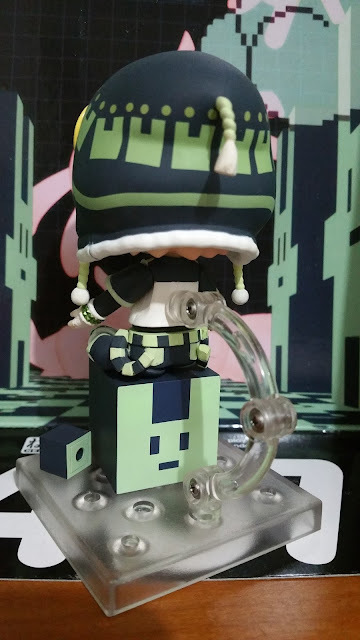 There is a realistic fold which causes the top of his beanie to flop slightly down, possibly also due to the weight of the string attached. Sadly, there are no creases in that region to show how the weight is distributed, such as creases where the string comes out from. 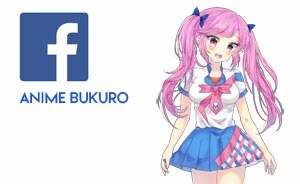 His pants show cubes of navy and green lined around to make his waist band, which has a different number from the official illustration. 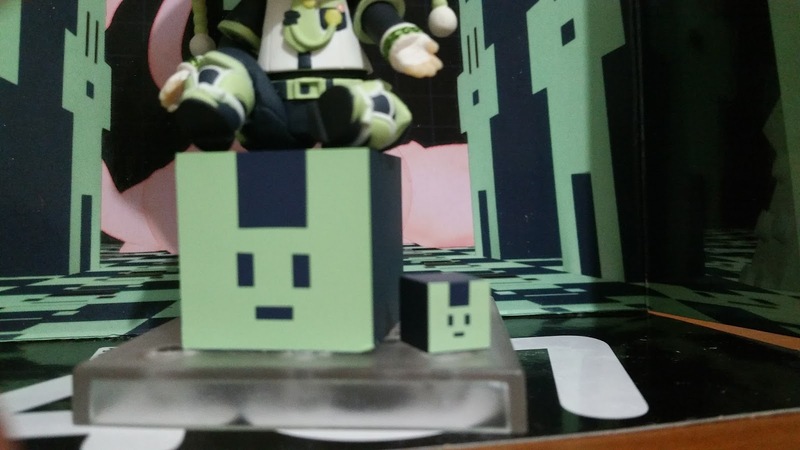 Initially, this caused an uproar among some fans but they quickly accepted the fact that it would be difficult to put more cubes of this size in there. The pockets are in green too, which draws attention to them among the navy of the rest of the pants. 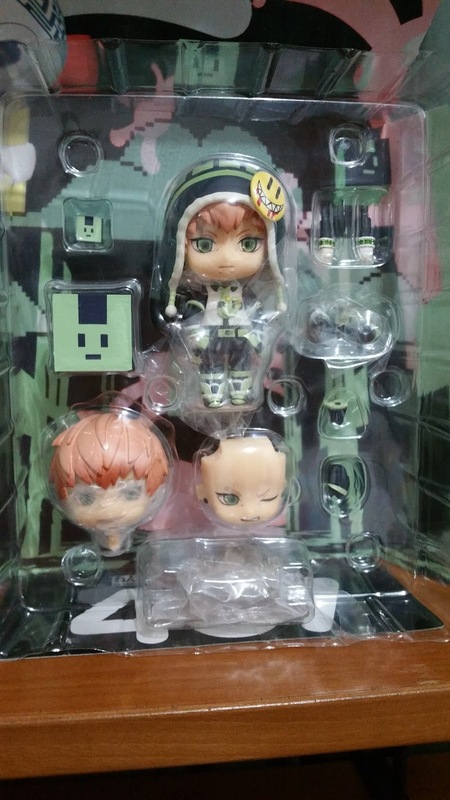 And now we have Noiz with his beanie off and in his annoyed expression. 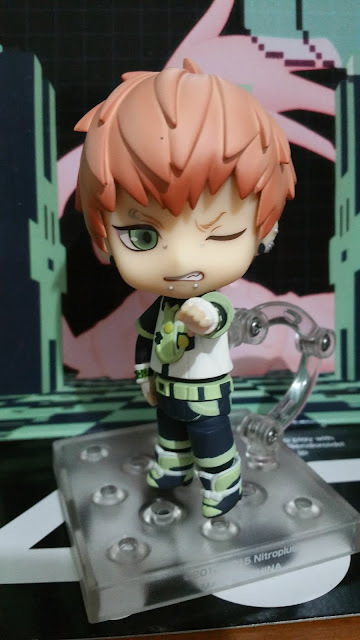 He seems to be telling us to stop taking pictures of him! 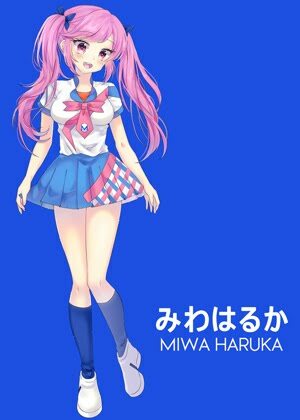 We see how the hair is all chunky and yet silky looking as it all sweeps out in one general consensus direction. 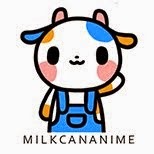 The once-hidden piercings on his ears are now shown, and complement those on his face... although that is a little too many piercings for me personally. We can contrast this to his other side where he comes with less piercings on his right ear. 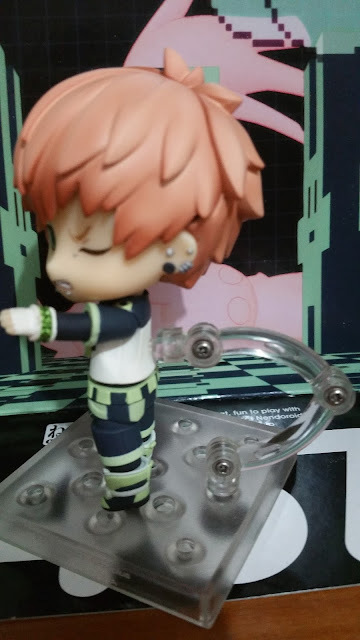 One striking problem of this Nendoroid is that there is paint transfer from his left thigh parts to the pelvic area of his seated bottom. This came with the Nendoroid when I first got it, probably due to GSC missing out on a plastic at that area to prevent paint transfer. 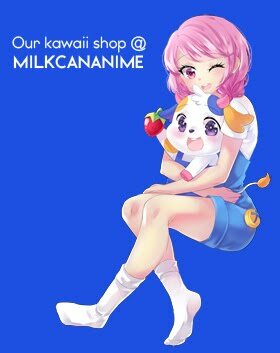 Back then, GSC wouldn't send me a replacement part but I didn't take it too harshly since it couldn't be seen normally. Though if you ever get a paint transfer like this in a prominent position, do try again and again to get GSC to listen to you (and don't give up like me!). Usagimodoki (Noiz's all-mate) comes in two different sizes and they have their own stands to hold them up (so Noiz's Nendoroid has 3 stands in total). 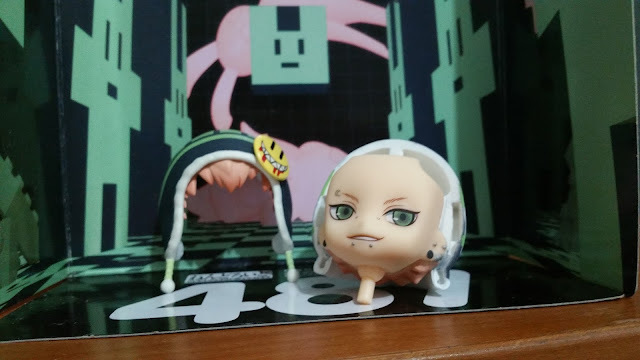 I opted to not use those for Usagimodoki and have them on the ground instead, with Noiz seated on it! 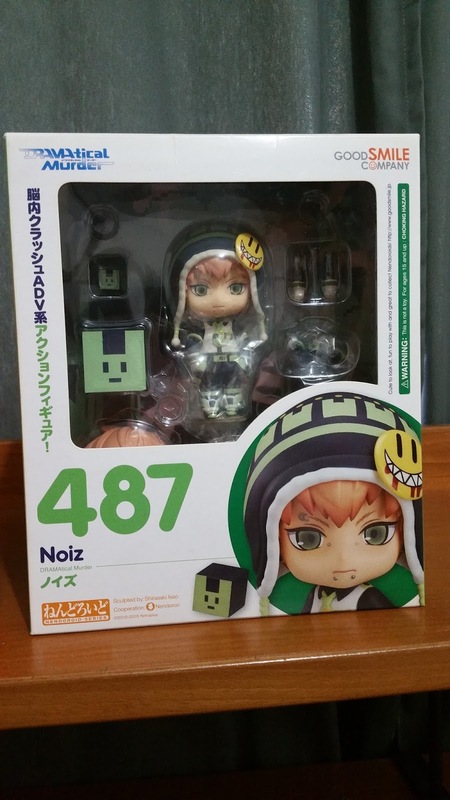 No Comment to " Figure Unboxing and Review: Nendoroid Noiz "